Grafe is no stranger to Conrad Centennial Singapore as he was the General Manager of the hotel from 1998 to 2013, during which Grafe was instrumental in building the repute of this 512-room award-winning hotel for delivering exceptional, inspired experiences that is synonymous of the Conrad brand. 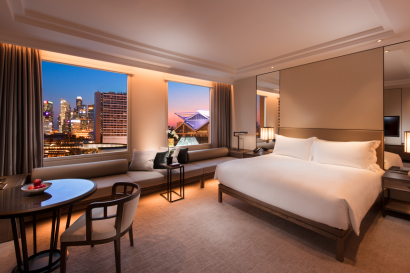 The preferred address of the globally connected traveler, Conrad Centennial Singapore pulsates with the dynamic Marina Bay area, the hub of the city’s world-class financial, cultural and culinary scenes. Recognized by a distinctive exterior architecture and an impressive Asian art collection within, the hotel is a destination for those seeking intuitive, worldly luxury, where life, business and pleasure seamlessly intersect. Conrad Hotels & Resorts is the destination for the new generation of smart luxury travellers for whom life, business and pleasure seamlessly intersect. A global brand consisting of more than 30 properties across 6 continents, Conrad Hotels & Resorts offer guests personalized experiences with sophisticated, locally inspired surroundings and connections to people and places around the corner or halfway around the world. Intuitive service is delivered with the Conrad Concierge App that puts Conrad’s services and amenities at the guest’s fingertips, whether ordering room service or a wakeup call to customizing the room’s pillow options or arranging reservations at our locally inspired cuisine and spa offerings. Conrad is a global luxury brand of Hilton. Conrad Centennial Singapore is a 31-storey; luxury hotel conveniently located in Marina Bay, adjacent to Suntec Singapore – Convention & Exhibition Centre, and close to Singapore’s major attractions and cultural centres. Contemporary in design, the hotel offers 487 newly refurbished guest rooms and 24 suites, each with an array of home comforts and modern conveniences such as 55” HD television wireless internet connectivity, an extensive line of toiletries as well as a choice of 15 different types of pillows from the Conrad Pillow menu. The hotel is home to an impressive Asian art collection, including original artworks such as the sculpture “Turbulence” by Rafael Barrios, a 15-foot geometrical sculpture located in the lobby; and “Harmony,” by Richard Sparling, a gigantic wall sculpture in the hotel’s driveway. Conrad Centennial Singapore also offers a variety of award-winning dining options and a 24-hour in-room dining service. 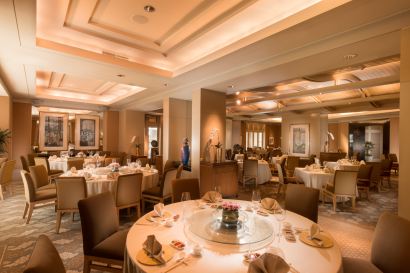 Enjoy the award-winning Golden Peony, a stylish Cantonese restaurant with artfully crafted delicacies and signature dim-sum as well as a thoughtfully selected wine list, as well as Oscar’s, which offers Asian and international cuisine. The Lobby Lounge, with its plush seating and ambient lighting, is a haven for a relaxing evening and ideal for discrete business and social connections, and The Terrace, with direct access to the shopping and business area next door, is a trendy option for breakfasts & lunches to enjoy alfresco or take away. With Singapore’s diverse cultures, dynamic outlook and commercial status, there are many attractions to visit during a stay at Conrad Centennial Singapore hotel. Visit the Singapore Zoo featuring 250 different species of animals, adrenaline-seekers should take a trip to Universal Studios Singapore for rides and movie-based attractions located on Sentosa Island, a serene resort only 7 km from the hotel, which also features pristine beaches and an 18-hole golf course. In the north of Singapore, visit the Colonial Heritage precinct where you can take a walking tour of the colonial buildings and learn about the colonial history of Singapore. Singapore is considered one of the best shopping areas in Asia. Shop luxury brands in one of the many shopping districts such as Orchard Road and Suntec City. Enjoy a wealth of shopping opportunities right next to the hotel in the Millenia development in Marina Bay. A passionate supporter of the arts and community at large, Conrad Centennial Singapore has been the official hotel sponsor of the Singapore Symphony Orchestra (SSO) since 1999. Through its close partnership with the SSO, the hotel has had opportunities to host famous artistes and musicians which include Yo-Yo Ma, Anne- Sophie Mutter, Tan Dun, Okko Kamu, Sarah Chang, just to name a few. Other contributions have included supporting of accommodation for the cast and crew of wellrenowned musicals like the ‘CATS’, ‘Cinderella on Ice’ and ‘Stomp’. The hotel’s over 3000 original artworks by Singaporean and Asian artists which are displayed throughout the premises, further exemplifies the hotel’s appreciation, dedication, support and development of the arts. 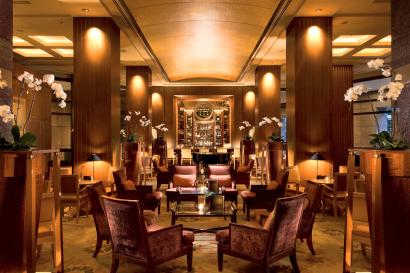 The Conrad Concierge app offers guests the ability to customize their stay from the minute they reserve a room. Conrad Concierge offers access to in-room dining, transportation, wake-up calls, choice of amenities, e-check-in, and all of the hotel’s other service offerings, all from the palm of your hand. Complete suite of luxury services including 24 hour doorman, nightly turn down service, 24-hour in-room dining, and dry cleaning/pressing services. 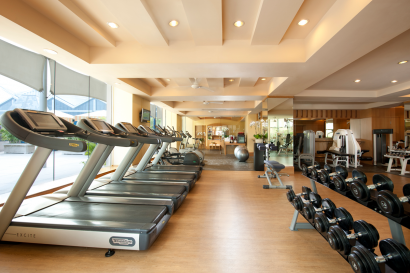 The hotel also offers a 24-hour fitness center featuring technologically advanced fitness equipment and workout sessions or indulge at The Centennial Spa offering massages and body treatments to rejuvenate and revive. 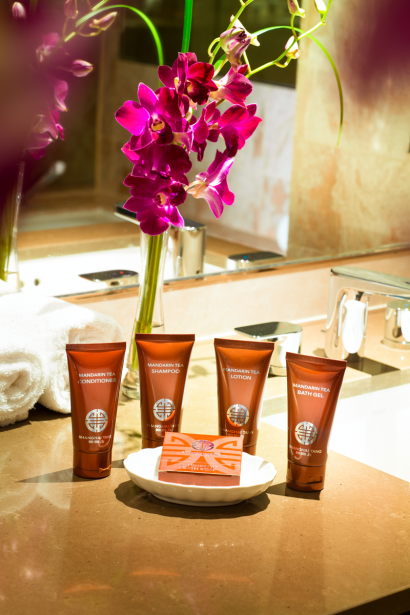 The hotel also provides customized amenities, with three choice brands including Shanghai Tang, Temple Spa or Refinery for Men. The hotel’s friendly multi-lingual staff is conversant in English, Japanese, Italian, German, French, Chinese, Korean and Filipino. Conveniently located in Marina Bay, 16 minutes from Changi Airport Singapore, adjacent to Suntec Singapore – Convention & Exhibition Centre, a short distance from Marina Bay Sands, the financial and business districts. Theatres by the Bay, the Singapore Flyer, six museums; the Colonial Heritage area and Marina Bay Sands. It is also connected to various shopping malls featuring global and Asian high-street brands as well as local restaurant options. The hotel enjoys direct access to the city’s Mass Rapid Transit. As part of the Conrad experience, each room receives a bespoke Conrad Centennial Singapore Teddy Bear and Rubber Duckie. Guests can also select their choice of bath amenities and pillows. 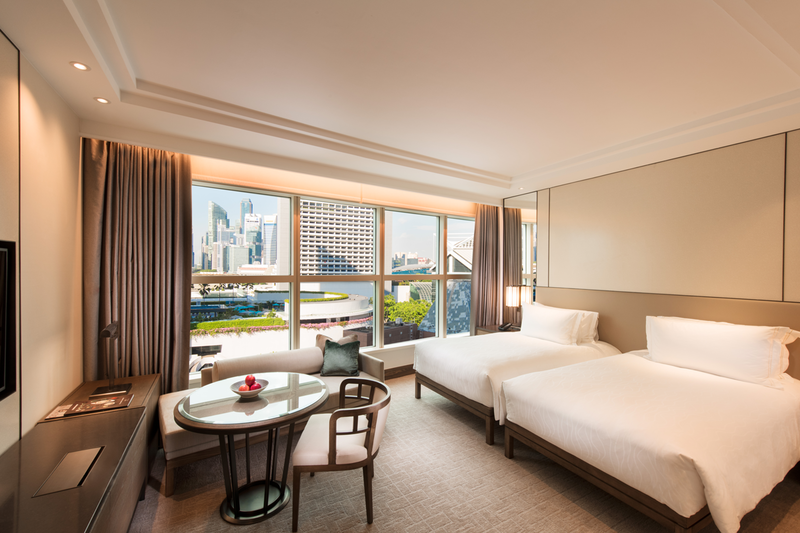 Enjoy modern comfort and sophisticated style with 512 guestrooms, including 25 suites and 101 connecting rooms spanning over 31 floors with luxury amenities. • Deluxe Room – Relax in this modern 40 sq. m./430 sq. ft. bedroom with Asian accents in the heart of Marina Bay. 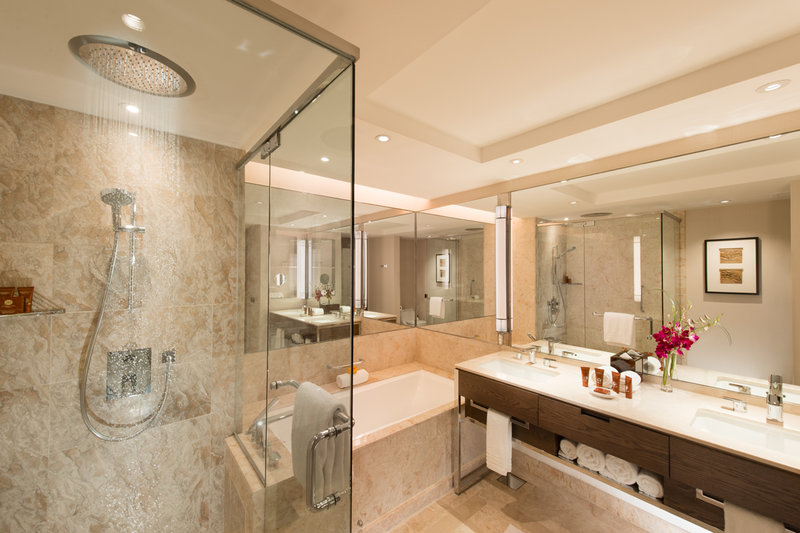 The spacious marble bathroom includes a double vanity sink, large bathtub and separate shower stall with rain shower. Be pampered with daily turndown, a well-stocked minibar and Nespresso coffee machine. • Grand Deluxe Room – Relax in this modern 40 sq. m./430 sq. ft. bedroom with Asian accents on the 13th to 17th floors. Lounge on the window sofa and take in the city view. Step into the spacious marble bathroom with double vanity sink, large bathtub and separate shower stall with rain shower. Be pampered with daily turndown, a well-stocked minibar and Nespresso coffee machine. • Premium Room – Relax in this modern Asian-inspired 40 sq. m./430 sq. ft. bedroom and enjoy complimentary daily buffet breakfast, standard WiFi, 20% discount at F&B outlets (excluding in-room dining), $20 laundry credit per day (non-accumulative), and 1 hour of meeting room usage (subject to availability). Lounge on the window sofa and take in the city view. Additional features include built-in universal power sockets, USB ports and an intelligent lighting system. • Executive Room – Relax in this modern 40-43 sq. m./430-460 sq. ft. bedroom with Asian accents on the Executive floors. Access the Executive Lounge to enjoy daily breakfast, afternoon tea and evening drinks with appetizers; as well as complimentary premium WiFi, local calls, light pressing for up to three items, and 2 hours of meeting room usage (subject to availability). Work comfortably from the sofa and movable table with built-in universal power sockets and USB ports. The spacious marble bathroom includes a double vanity sink, large bathtub and separate shower stall with rain shower. • Centennial Suite – This modern 63 sq.m./680 sq. ft. suite with Asian accents, offers separate living area, bedroom and luxurious bathroom. Lounge on the long daybed by the window in the living room or rest in the cozy bedroom. The spacious marble bathroom includes a double vanity sink, large bathtub and separate shower stall with rain shower. Be spoiled for choice with Yukata or bathrobe, luxury-branded bathroom amenities and 15 types of pillows from our pillow menu. Be pampered with daily turndown, a well-stocked minibar and Nespresso coffee machine. Enjoy the executive lounge access and enjoy its benefits. • Conrad Suite – The 143 sq. m./1539 sq. ft. President Suite is the epitome of luxury with separate bedroom, living and dining areas, as well as a pantry, powder room, walk-in wardrobe and luxurious marble bathroom with large bathtub and separate glass shower. Located on the 30th floor, this suite offers stunning views of the City, Marina Bay or Suntec City Fountain of Wealth. Access the Executive Lounge to enjoy daily breakfast, afternoon tea and evening drinks with hors d’oeuvres, as well as complimentary premium WiFi, local calls, light pressing for up to three items and two hours of meeting room usage (subject to availability). Be spoiled for choice with Yukata or bathrobe, luxury-branded bathroom amenities and pillows from our pillow menu. Be pampered with daily turndown, a well-stocked minibar and Nespresso coffee machine. You have the option to check in digitally, customize your stay prior to arrival and even access your room using a Digital Key on your mobile device via the Hilton Honors app. Discover a multitude of memorable dining experiences at Conrad Centennial Singapore. Choose from refined Cantonese specialties, inspired international and local buffets, premium drinks, and Executive lunches. Executive Chinese Chef Ku Keung together with an award winning team of Hong Kong culinary experts create an intricate menu featuring only choice Cantonese ingredients specially imported from diverse regions of China. Sample signature dim-sum in a variety of exotic flavor combinations or choose from a variety of superbly refined Cantonese dishes on offer. Golden Peony boasts an extensive wine list, specially chosen to complement Cantonese cuisine. For a unique dining experience in quiet sophistication, Golden Peony also features a private dining room for up to ten guests. Golden Peony is listed in Singapore Tatler’s 2017 Best Restaurants Guide and Wine & Dine’s 2017 Singapore’s Top Restaurants Guide..
Oscar’s provides a culinary journey that will feed your senses. 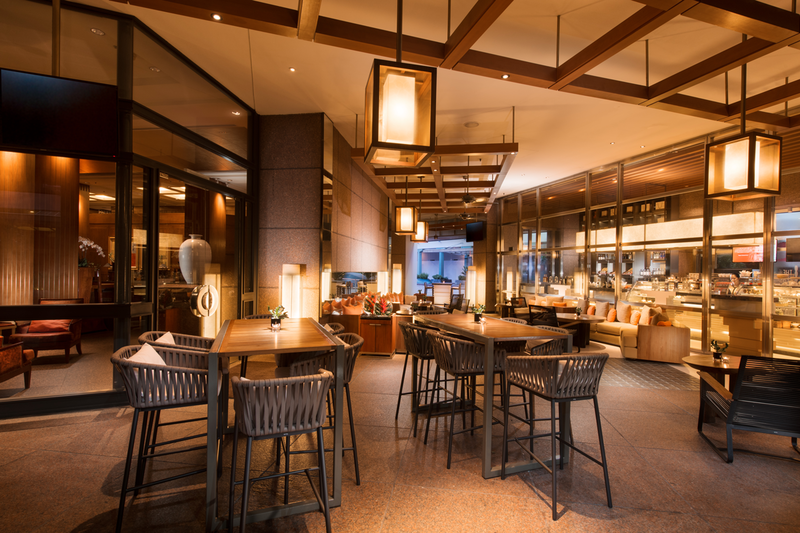 Serving breakfast, lunch and dinner, this all-time favourite restaurant offers a vibrant space to revive and refresh. 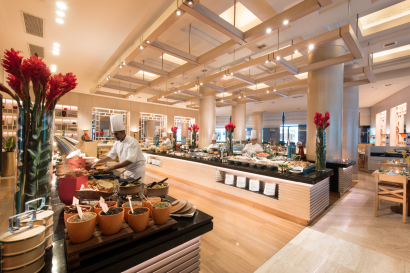 Enjoy an impressive buffet highlighted by the largest Caesar salad station in town, freshly shucked oysters, succulent seafood-on-ice and live carving stations. Oscar’s outdoor noodle bar serves steaming bowls of local favourites such as Laksa and Prawn Noodle Soup. A wide selection of over 40 wines-by-the-glass is offered, as well as a tempting selection of desserts including the hotel’s signature home-made waffles with ice cream. Supercharge your afternoons at Oscar’s Sunday Brunch. Indulge in succulent seafood on ice, hot-off-the-BBQ lobsters and premium cuts of beef, as well as roasts at the carving station. Balance all that indulgence at the 4-metre-long salad bar, chilled shakes, a la minute organic pasta and poached eggs on English muffins served with decadent toppings. The Terrace, with direct access to the shopping and business area next door, is a trendy option for breakfasts & lunches to enjoy alfresco / take away, or enjoy artisan sandwiches, signature pastries, cookies, cakes, gourmet coffee and tea. The executive lounge on level 31, with panoramic view of the city, is an exclusive retreat for Executive Room and Suite guests. Enjoy complimentary WiFi, buffet breakfast, afternoon tea, and evening cocktail with hors d’oeuvres; as well as all-day coffee, tea and soft drinks till 10pm. • Executive Chinese Chef Ku Keung is a well known culinary personality in local media and hailing from Hong Kong, Chef Ku is known for his creative style and preparation of exquisite Cantonese cuisine which promises a unique dining experience. The Executive Chinese Chef has also served in many Head of State dinners and VIP events which have been well received. Indulge at The Conrad Spa offering massages and body treatments to rejuvenate and revive. 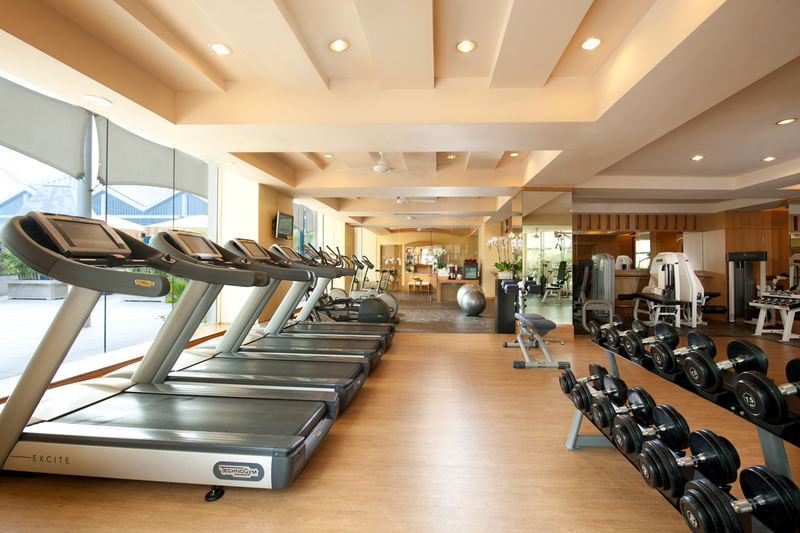 Work out at the 24-hour fitness center featuring technologically advanced fitness equipment and workout sessions. Refresh by plunging into the 20m lap pool and swim lengths before unwinding for a relaxing massage at The Conrad Spa. 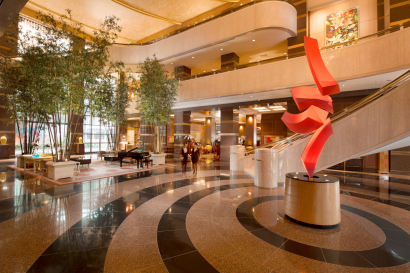 With its prime business location in Marina Bay, close to the financial and business districts, and adjacent to the Suntec Convention and Exhibition Center, Conrad Centennial Singapore is the ideal business hotel in Singapore for meetings and conferences. Conrad Centennial Singapore’s meeting and events venues include a ballroom, Grand Salon, Pavilion, 5 Private Salons 2 Boardrooms and 4 Conference rooms. Work alongside our dedicated team to choose special themes and create a personalized event with choice of settings and services.